The lack of independent innovation capability and the lack of industry-wide core technologies are serious challenges that the internal combustion engine industry in China is facing. The reporter recently interviewed Ni Hongjie, an old expert in the internal combustion engine industry. He believes that the establishment of an independent innovation system has become an urgent matter for the development of China's internal combustion engine industry. Reporter: The development of the internal combustion engine industry has been a hundred years old. Can you briefly describe the history of the development of internal combustion engines in China? Ni Hongjie: The first internal combustion engine in China was an imitation gas machine in 1908, which lasted 100 years last year. Before the liberation, due to the restrictions and influences of the natural environment, historical environment, and external environment at that time, the internal combustion engine industry in China still remained in the workshop-style single-piece production method. The output was less than 10,000 hp, and many raw materials and spare parts were also required. Relying on imports, the national internal combustion engine industry is on the verge of bankruptcy. After the founding of the People's Republic of China in 1949, the party and the state attached great importance to the internal-combustion engine industry and began to resume production. After several generations of efforts, until the reform and opening up, the internal combustion engine industry initially established a relatively complete internal combustion engine industrial system, but this system is Those that were suitable for the planned economy at that time were mainly for agricultural, military, and small ship services. Now it seems that the system is still relatively old. After the reform and opening up, the structure of the national economy changed. According to the new situation and new requirements, especially the requirements for the development of various industries such as automobiles, construction machinery, agricultural machinery, ships, petroleum, transportation, and military industry, the internal combustion engine is an accessory product, and the original old system becomes inapplicable. In the automotive industry, the automotive industry is the largest market for the internal combustion engine industry, but the old system simply cannot adapt to the development of the automobile industry. Therefore, the product structure and enterprise structure of the internal combustion engine industry were adjusted, and a large number of new products were developed through independent innovation and the introduction of technology. After the country has issued a timetable for the implementation of relevant emission regulations, the internal combustion engine industry has successively developed the engines of the country 1, country 2, and country 3 through various channels, and has already mass-produced and put on the market. The products of State 4, Country 5 have been developed by several large-scale enterprises in the industry, and are placed on the market. In the past 30 years, the internal combustion engine industry has achieved great success. According to the â€œEleventh Five-Year Planâ€, by 2020, a modern, multi-tiered new type of internal combustion engine industry system is expected to build. It can be predicted that in the near future, the completion of a modern internal combustion engine industry system with diversified funding sources and multi-level products will surely make greater contributions to the development of Chinaâ€™s industry, agriculture, transportation, and national defense construction and technological progress. .
Reporter: Last year, the production volume of automotive engines has reached 8.66 million units. Can this show that China is already an engine producing country? Ni Hongjie: No, China can only now say that it is a large producer of internal combustion engines, not a powerful country. There are two main reasons to say this: First, China's ability for independent innovation is too weak to develop modern, internationally competitive products. This is the most basic and deadliest. The output of the internal combustion engine industry in China is very large, and it is also ranked first in the world. However, careful analysis shows that the research and development capabilities of high-tech new products in China are still very different from those of foreign countries. At present, we have not yet mastered the core technology of the internal combustion engine field. This core technology is mainly in the high-tech field, including the fuel system, and post-discharge treatment. We do not have this capability or this capability, so we must engage in joint development with foreign countries. Second, there are many products produced by internal combustion engines in China, but there is not a brand with international competitiveness, such as Cummins of the United States, which will be recognized by users. Therefore, China can only be regarded as a big producer, not a powerful country. The situation that has caused us to lag behind is multifaceted. Apart from the two most important factors mentioned above, there are also other issues, such as industrial equipment, personnel quality, and management level. The gap with internationally renowned companies is obvious. In addition, up to now, such a big country, we do not have a professional research institute with a global concept of an engine to support it, and it is also a major factor in China's weak ability to independently innovate. None of these can be solved in the near future. Therefore, in the â€œEleventh Five-Year Planâ€, we propose to fundamentally solve the problem of development capacity, production, operation, and talent of the internal combustion engine industry in 2020, so that China will become a strong country from a big country. Reporter: It is understood that the internal combustion engine industry has problems with low-end duplication and homogeneity. How do you think that such common industry defects should be solved? Ni Hongjie: The problem of low-end repetition and homogenization is a common problem in China's machinery industry. This is mainly an institutional problem, which is difficult to solve at present. It is not the era of planned economy. It takes the above batches to build factories. Now that the factory can be built with money, it can be done. Especially the low-end engines, such as low-end single-cylinder diesel engines, multi-cylinder diesel engines and other products, have been produced for many years, and accessories are very mature and can be purchased everywhere. Now some self-employed, build a factory, make a simple assembly line, buy spare parts, assembly can leave the factory, this situation is very common in Jiangsu and Zhejiang. This issue is an institutional problem. At present, some local governments will approve the establishment of a batch of small businesses as described above in order to raise local GDP, tax revenue, and solve the problem of the employed population. They lack the guidance of a global perspective and indirectly contribute to the homogeneity of low-grade products. To fundamentally solve this problem, we must start from China's industrial management system, establish a barrier to entry, if necessary, should also specify what kind of product does not allow reproduction. Some big companies will also produce some low-end products for production value and profit. In particular, last year, after the economic crisis, the market fell. Enterprises would produce some low-end products in order to survive, produce value, and solve employment. This situation is not absent, but it is rare. According to my understanding, this is only a temporary measure and will not be a long-term development direction. Basically large companies still engage in R&D and high-end on the basis of the original. Reporter: Independent innovation is the only way for companies to grow. What do you think internal combustion engine companies need to implement their own innovations? Ni Hongjie: In the past few years, especially after the Central Government specifically proposed the issue of independent innovation in 2005, the biggest gains from the media and other aspects of publicity have been that enterprises have greatly improved their ideological understanding. They must recognize that companies must develop and survive. Engage in independent innovation. Nowadays, companies generally begin to build their own independent innovation systems, especially large-scale enterprises, including Yuchai, Weichai, and Xichai. And some companies do hire some talented people from home and abroad. This is hope. The most critical thing in realizing independent innovation is talent. Some equipment can be purchased, but equipment is dead and people are alive. What kind of level should the new product achieve in the world, what parameters are there, and how should it be handled? These need talents to solve. In addition, China has Chinaâ€™s national conditions. For example, Chinaâ€™s trucks require â€œDura Runâ€, how to match the engine and the chassis, and which components should be strengthened, should be considered by Chinese users. Therefore, it is not enough to depend entirely on foreign countries. It must be considered in the light of China's situation. This also requires talent. Not long ago, when I went to Yuchai, I saw that Yuchaiâ€™s product lab equipment was comparable to foreign countries. In the past, Yuchai had a tradition of recruiting talented people, and now it is even more prosperous. Many experts at home and abroad have been recruited, and research and development capabilities have been rapidly improved. Xichai is another feature. When joint development is carried out, it is very important to pay attention to the whole process and the other party's technical staff. What problems arise from the product design, parameter determination, design and development, trial production of new products, production and matching and matching of automobiles, and how to modify them. The series of projects were sent together to carry out joint development through the entire process, and a group of technicians were trained in practice. After returning to the company, they became the technical backbone of the company. The ability of independent innovation was greatly improved. When new products were subsequently developed, Independent development of the design work will soon become a matter of course. Reporter: Some companies do not attach importance to the development of independent innovation systems in their development. Do you think this has anything to do with the general environment of the entire society and related policies? Can governments, companies and research institutes coordinate with each other? Ni Hongjie: To engage in independent research and development actually depends on the situation of the enterprise. Some companies have this ability, and some companies do not. At present, some large enterprise groups, or small and sophisticated enterprises that have authority in the production of a certain component, can engage in research and development on their own. However, small and medium-sized enterprises may not necessarily engage in research and development. They do not have this capability and do not have such a condition. At present, China's internal combustion engine industry is still relatively decentralized, and the degree of concentration is not enough. There are more than 200 enterprises and parts and components enterprises with 800 to 900 parts and components. In the future, some enterprises must be eliminated by the market. For some companies, doing low-end products is only to solve the survival problem. For large companies with promising future development, independent innovation cannot be avoided. To engage in independent innovation, we must have the attention of business leaders and government support. Some powerful companies have enough knowledge in this area, but some problems must be supported by the government, such as funding issues and coordination between industry and industry. In addition, cooperation between enterprises, institutions of higher learning, and research institutes is also very important. We must take the road of integration of production, education, and research. What the company mainly solves is the practical new technology development that is needed now or in recent years. The forward-looking new technologies in the next five to ten years will not necessarily require companies to do it immediately and they can hand them over to the institute. Of course, qualified companies can also do some of their own and accelerate the pace of R&D. There is no need to focus their efforts here. Reporter: As an old expert, I have a deep understanding of the internal combustion engine industry. What good advice and advice do you have for developing companies? Ni Hongjie: For companies, the current emphasis is still on the need to raise the capacity for independent innovation. This is the core issue, and it is also the issue of stuck necks. To reach the international advanced level, it is necessary to develop products with international competitiveness and it is impossible to leave independent innovation. In terms of long-term development, to achieve sustainable development and scientific development, it is necessary to solve the issue of independent innovation in the high-tech field. It is impossible for others to sell you core technologies. If you do not solve high-tech problems, you must be limited to people. You can only position products at the low end. The development of high and new technology must also be capable of doing something wrong. We must not make all efforts to solve the problem, and we must first solve the recent and current urgently needed technologies. We can put too far into the future. In addition, some things can be outsourced. The so-called independent innovation does not mean exclusion, nor does it mean that everything must be its own. LINA Cooling Type Rubber Two Roll Mill is mainly applied for rubber materials that need to be cooled during the milling process. The cooling function of LINA Two Roll Mixing Mill is stable, and its effect is uniform due to the design of the roller`s water holes. Safety function is LINA Open Mill`s first consideration. 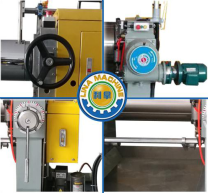 It is worth to mention LINA Two Roll Open Mill`s safety devices have gained several national patents. 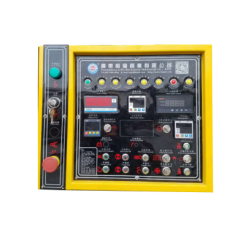 LINA engineers have researched and developed comprehensive safety devices like 360 degrees emergency stop button, reverse braking devices, ergonomics safety device and infrared sensor etc. Materials are intensively mixed by the roller so that polymers are bonded with fillers more effectively. The rollers are made in Taiwan and assembled in LINA factory. Rollers can be mirror treated and heat harden. 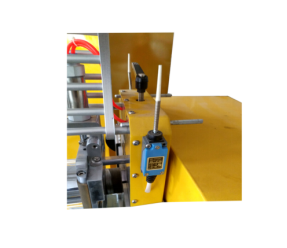 The roller adopts 360 degrees emergency and reverse braking devices, infrared automatic detection and ergonomics security to ensure the user`s safety. 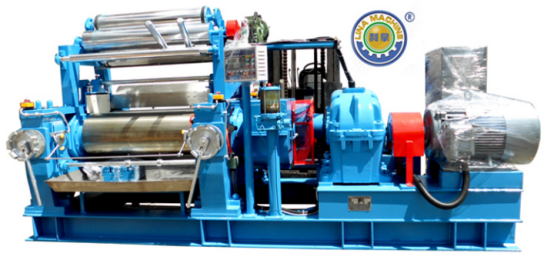 LINA Two Roll Mixing Mill`s control panel adopts 360Â° Rotatable panel which can be operated from different angles. LINA new design laboratory roll milling machine with comprehensive optional functions and secure devices, which ensure the accuracy of formula and high efficiency. Components are imported from Taiwan; the brand of reducer is LINA. This system can easy to import or export data, programming and recording, touch screen is provided. The rollers are made of vanadium-titanium alloy, which is treated by nitriding and the surface hard chromium plating. Clean up the material without dead corners, smoothly and evenly handle and easy discharge materials.